The gifts are all wrapped, the house has been cleaned, everything at work has been completed. All the deadlines of newsletters, Christmas cards, and shopping have been met. In just a few hours, our church will begin their Christmas Eve services, family will be coming over, and I’ll be bombarded with the eager excited voices of my children. In this quiet time at work, I just want to breathe and to reflect on Christmas. Tonight is the night we have chosen to celebrate the birth of Jesus. What must it have been like for the shepherds? I imagine they were humble people for they were considered to be the “bottom rung” of society. Feeling the boredom of watching the sheep graze, they probably huddled together in attempts to keep warm, quietly chatting to keep themselves awake not realizing the miracle that was about to unfold. What of the wise men? Even though they weren’t there for the birth, but were there 2 years later, what struggles did they face in their journey? To step out into the unknown, leaving behind what they knew, to reach for something based upon their studies and a star shows an extreme act of faith! How many of us would do that? What of Mary? Being nine months pregnant, balancing herself and her big belly on top of a wobbly donkey, and sleeping on the hard ground, must have been torture; and yet, she did it. And Joseph? The feelings that he must have wrestled with knowing that the baby was not his and not fully understanding the miracle that he was chosen to take part in. And Jesus? I imagine his little pudgy baby arms flailing in the cold as he was introduced to this new harsh world. As Mary, Joseph and the shepherds watched, did they know that those little hands would someday have a nail driven through them? Did they know that his tiny infant cries would turn into screams of agony as he takes the punishment of the whole world? Did they understand how his heart would break for thousands of years to come as people would reject his love and sacrifice? Did they know that someday, this little baby would come back as a King and right the world? Most likely not, but we can know. Christmas is the day we’ve chosen to celebrate not just Jesus’ birth, but the beginning of our redemption. If you have not yet accepted his gift of forgiveness and sacrifice, I urge you to do so. I’d like to wish you all a Merry Christmas! I’m a Hallmark Christmas movie fanatic. There’s nothing better than making it through a long work week to come home curl up with a cup of hot chocolate and watch a movie about love and sacrifice. This past weekend, I felt as if I was in one of those movies. 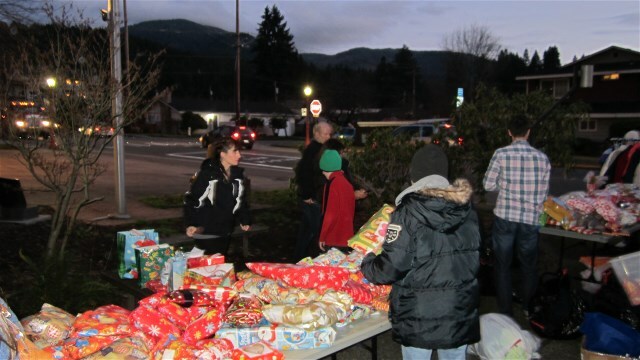 Our non-profit, The Trail Youth Outreach, held its first Christmas event for people in crisis. All over the community, people rose to the occasion to give and to collect warm coats, hats, gloves, hoodies, hand warmers, and toiletries. 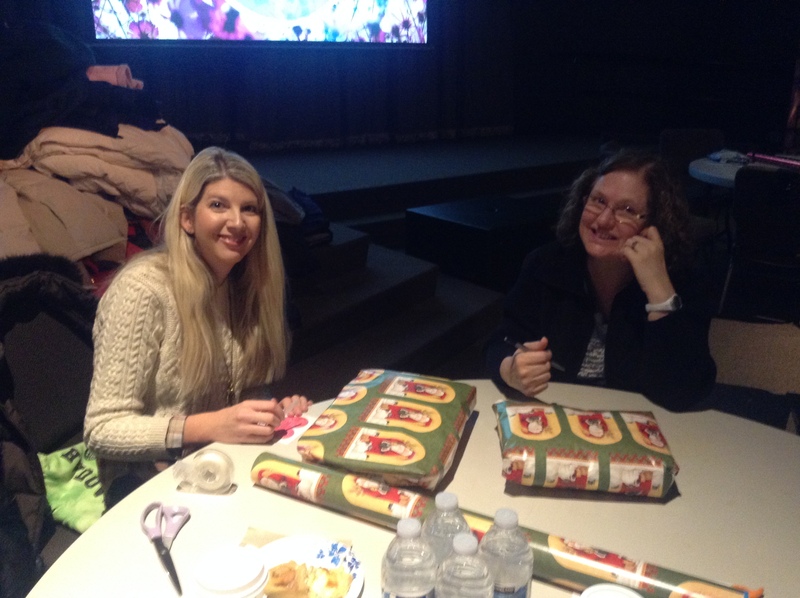 Teams of people tirelessly wrapped each item in colorful festive Christmas paper. 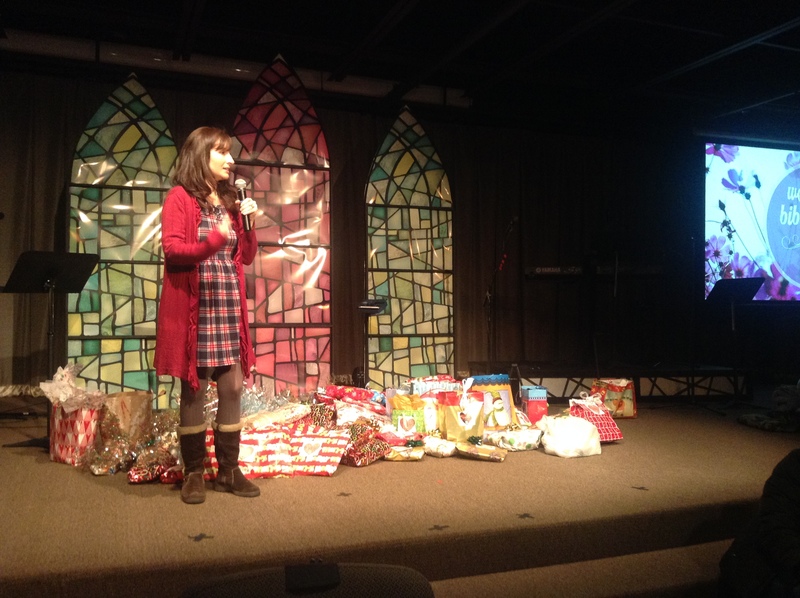 When all the gifts were brought to one place, I stood amazed at the generosity of the community. 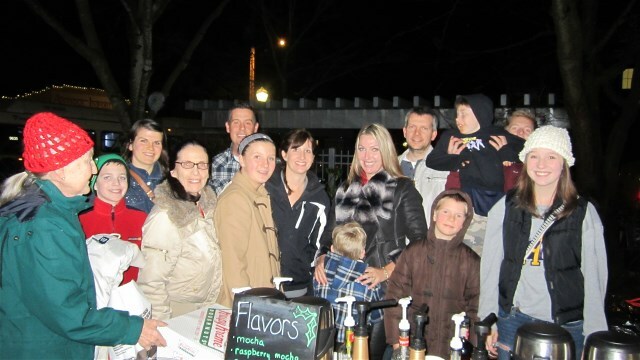 There was such an abundance that we had to move the gift tables outside! As those in crisis came to the Community Hall for the normal dinner hour, they were shocked and excited. They had a lot of fun digging through packages to find what they needed. Thank you to all of you who donated, collected, and wrapped the gifts! 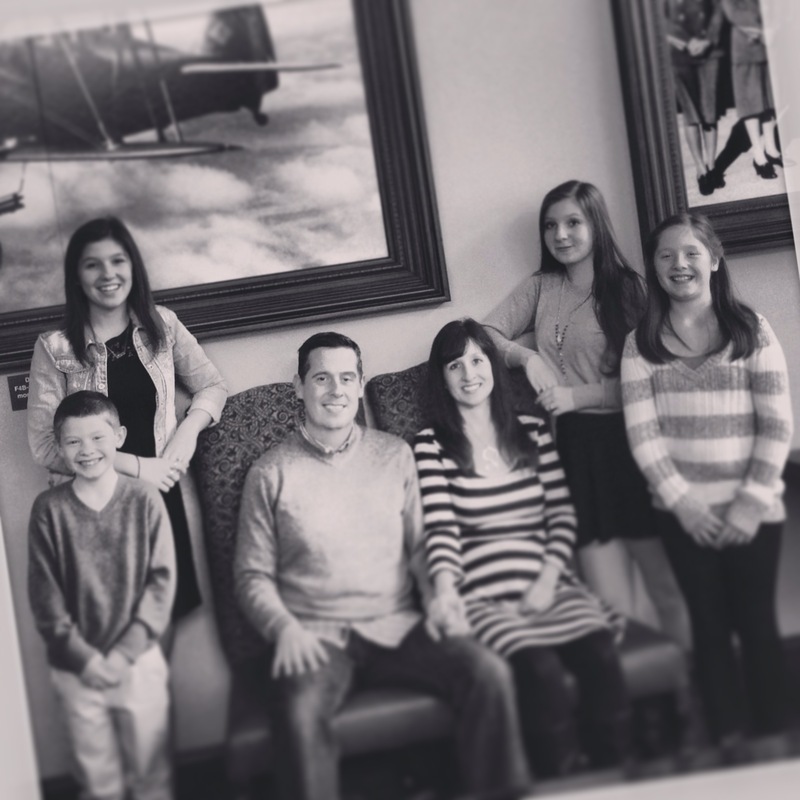 A shout out also needs to go to Maggiano’s who provided a real Italian experience with their cuisine. 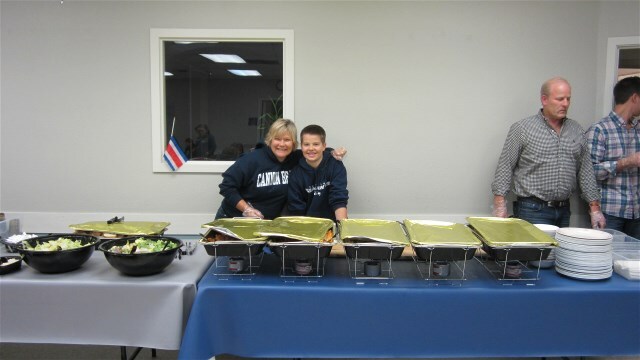 Josh Roth, the restaurant’s manager stayed and worked alongside another community group in the set up and serving of the food. No event is complete without music! 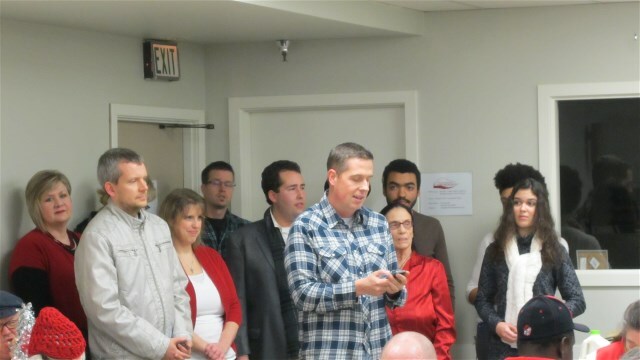 Dan Hegelund and his Common Ground Choir made a special appearance gracing us with Christmas carols. To top off the evening, everyone was sent off with a cup of specialty hot chocolate and coffee made by the teens of the Trail Youth. 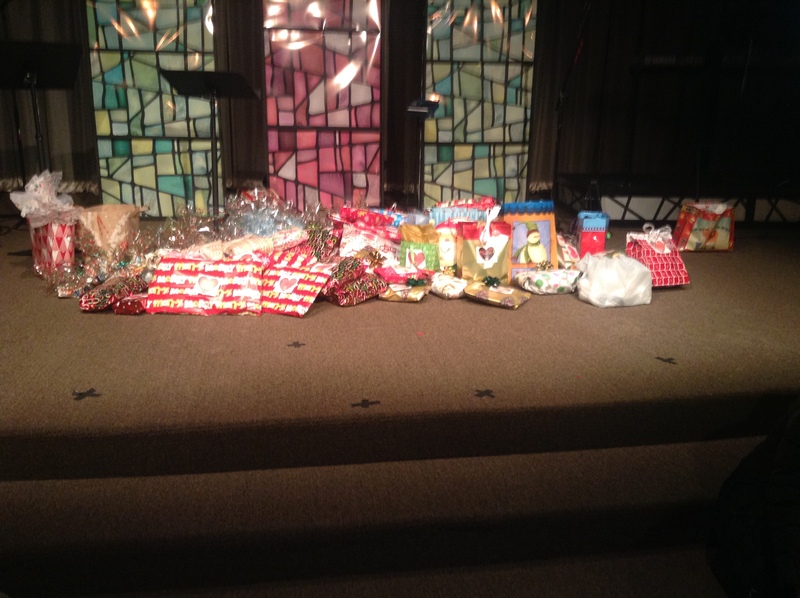 The left over gifts and coats were divided up and sent to our sister outreach in Tacoma and the Teen Challenge Rehab. in Graham! What is the true meaning of Christmas? The movies often get it right, it’s about giving not receiving. Christmas is about love, sacrifice, and the giving of hope. On December 12th, Christmas was lived out. Thank you to all of you who participated! December 12th!!! Today is the day! I feel as if I’m reading a mystery book. As I’m drawing closer to the end, my anticipation builds with excitement and curiosity. How is this going to end? Yesterday was another God moment. 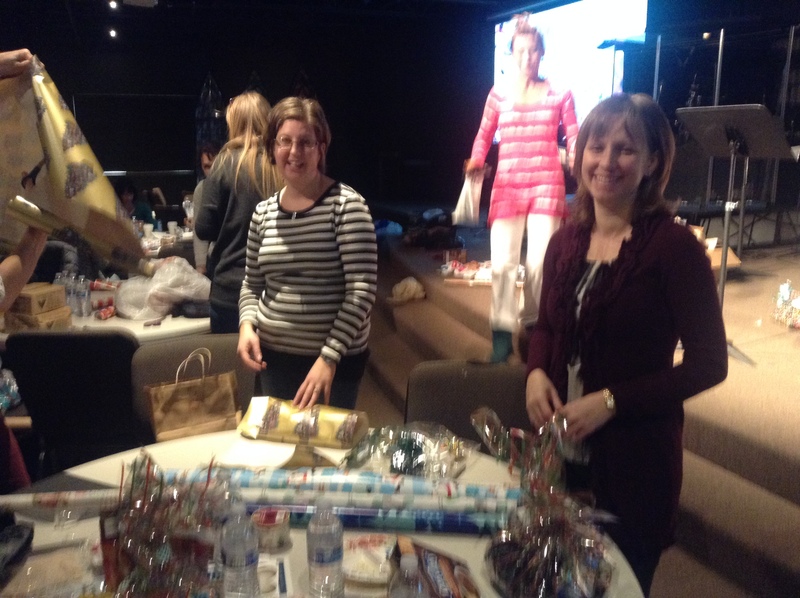 A women’s Bible study group met together to wrap the gifts they all had gathered. Clothes and coats were heaped along with hand warmers and goodies. With much care, these ladies took sweaters and matched them up with hats, scarves, and gloves wrapping them as a set. When they were all finished, they called me in (I was in the office working). It was so hard to thank them for the tears kept coming! We had to call in another vehicle to transport all the gifts! This is the true meaning of Christmas being lived out in the lives of all these people. Jesus gave of Himself for all of us, how can we do any less? 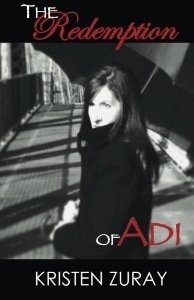 The novel, The Redemption of Adi,</strong> is now available for purchase! It was a week before the wedding and Adi just wished it were over. After the realization that Ze’ev didn’t really love her, all the joy had vanished from the wedding preparations. Life had fallen into a routine of pretending to be a happily engaged couple to the the public and separating upon their return home. 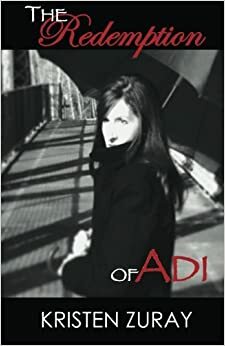 So often Adi had thought of locating Matthew, but then decided it was too late for her since the Prince was dead. In an attempt to deal with the situation, she tried to find happiness in the fact that she was no longer bound to Rasha and no longer starving on the streets. Other than love, all her other dreams had come true. Sighing, she broke away from her musings and looked out at the warm sun streaming through her window. It was going to be a beautiful day and she was going to enjoy it at her favorite park. Every bride needed a break from the stress of planning a wedding! “Ambassador, Adi is headed to the park, ALONE.” Gabriel announced placing special emphasis on the word alone. “Ze’ev’s not with her?” Matthew inquired. “No, only Dagon follows. It seems as if the Shedim believe they have already won.” Gabriel smiled. “Yes, sir!” Gabriel responded with energy. It wasn’t long before Gabriel found Jordan and a small band of Watchers entrenched near the flower shop. A few moments passed as the group huddled in a tight circle formulating a plan. As soon as Gabriel left, Jordan discreetly transformed once more into the elderly florist. Hailing a cab, he headed off towards Ze’ev’s home. One by one the other Watchers followed suit. Some remained in their natural state casually flying towards the target while others blended into the bustle of the busy streets and sidewalks. Arriving undetected they gathered in the shadows across the street from the house. “Gabriel, where’s Michael?” Jordan asked half expecting to meet up with the commander. “Or maybe they found out we were coming and have planned an ambush.” Jordan whispered. The band of Watchers all nodded their heads in understanding. Stepping out of the shadows, Jordan waved the rest to follow slowly and cautiously. Making it across the street undetected, they entered into the house. All was quiet except for a faint chanting music that seemed to float on the air. With stealth, they crept towards the sound. Upon reaching the door from which the music was coming, Jordan motioned for swords to be drawn. Pushing the door open a little, he was able to see Ze’ev sitting peacefully, legs crossed, palms upward. Shakti hovered above, instructing him while two other Shedim loafed nearby. Turning to the waiting Watchers, Jordan signaled the number of Shedim. “Your deceiving days are over, Shakti!” Swinging with all his might, Jordan sent Shakti tumbling and screaming into the fires. “Shakti?” an alarmed voice broke through the fading screams. Jordan looked at Ze’ev who sat blinking in confusion. Ze’ev had been sitting completely mesmerized by Shakti’s words when he felt a disturbance of energy enter the room. He had seen Shakti’s look of alarm before disappearing completely. Not understanding what had happened, Ze’ev jerked awake calling out to her.